What Comes After Acheson’s Creation? He was present at the outset of the old order. His insights could help our leaders develop a new one. Let’s step back from the daily chaos and look at a big, pressing question. Last fall at a defense forum a significant military figure was asked: If you could wave a magic wand, what is the one big thing you’d give the U.S. military right now? We’d all been talking about the effects of the sequester and reform of the procurement system and I expected an answer along those lines. Instead he said: We need to know what the U.S. government wants from us. We need to know the overarching plan because if there’s no higher plan we can’t make plans to meet the plan. This was freshly, bluntly put, and his answer came immediately, without pause. The world is in crisis. The old order that more or less governed things after World War II has been swept away. The changed world that followed the fall of the Berlin Wall is also over. We’ve been absorbing this for a while, since at least 2014, when Russia invaded Crimea. But what plan are we developing to approach the world as it is now? That’s sort of what a lot of those interested in foreign policy have been doing in recent years—staring in shock at the wreckage. But something has to be rebuilt. Everyone now has to be an architect, or a cement-pourer, or a master craftsman carpenter. It’s been instructive the past week to reread a small classic of statecraft, “Present at the Creation” by Dean Acheson, published in 1969. As undersecretary and then secretary of state he was involved in the creation of the postwar order. What came after the crisis was the Marshall Plan, in which the U.S., itself exhausted by the war, helped its allies, and enemies, survive and resist communism. 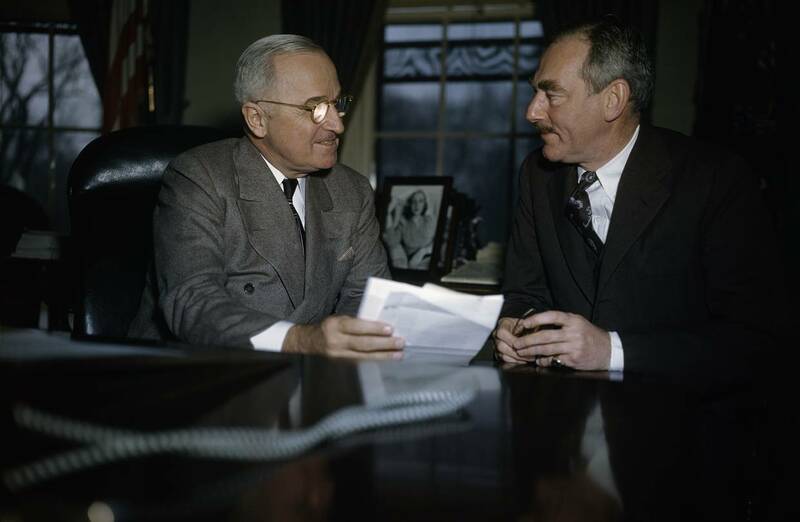 The objective, as the Truman administration declared it, was not relief but revival—spending American money to bring back agriculture, industry and trade. New financing was needed from Congress, in amounts then thought impossible—hundreds of millions that became billions. It was an effort appropriate to its time. Apart from its essential good—millions didn’t die of starvation, nations such as Greece did not fall to communism—it brought America more than half a century of the world’s sometimes grudging but mostly enthusiastic admiration. They now knew we were not only a powerful nation but a great people. This was not unhelpful in times of crisis down the road. It is exciting at a time like this to read of the development of a successful foreign-policy effort from conception to execution. And—how to say it?—Acheson’s first-rate second-rateness is inspiring. This was not a deeply brilliant man, not a grand strategist, but more a manager who was a good judge of others’ concepts. He could see facts—he had sturdy sight—and spy implications. He had the gift of natural confidence. He could also be clueless: One of his most respected aides was the Soviet spy Alger Hiss. What is inspiring about Acheson’s first-rate second-rateness is that he’s like a lot of those we have developing foreign policy right now. Acheson, though he did not present it this way, provides useful lessons for future diplomats in future crises. • Be able to see your work soberly. Keep notes so history will know what happened. “Our efforts for the most part left conditions better than we found them,” Acheson says. Especially in Europe, which was dying and went on to live. • Cheer up. Good things can come of bad times, great things from fiercely imperfect individuals. Still to be answered: What is America’s strategy now—our overarching vision, our big theme and intent? What are the priorities? How, now, to navigate the world? That soldier needs an answer to his question: What do you need from us? What’s the plan?